There is a clear sea change in the quality of Disney’s animated movies once they acquired Pixar in 2006. “Bolt” was the first film produced after the merger, and it marries the sensibilities of both companies reasonably well, though still has too much of the old Disney stodginess. Over time, though, the Pixar Way shone brighter with each release, and with the 1-2-3 punch of “Tangled,” “Wreck-It Ralph,” and “Frozen,” Disney is succeeding both critically and commercially at a level that they haven’t enjoyed in a while. With “Big Hero 6,” the Marvelization of Disney films has begun (Disney purchased Marvel Entertainment in 2009, and “Big Hero 6” made its Marvel comic debut in 1998). It is a superhero movie about science nerds, a film where no one escapes a bad situation using anything other than their brains. In fact, brute strength does not factor once in the proceedings. Peter Parker and Tony Stark would be proud. So would Walt Disney, because the movie has a ton of heart. Also, the lead character’s parents were killed 11 years before the opening scene. That’s the Disney way. Hiro Hamada (Ryan Potter) is a bored boy genius living with his aunt and his brother Tadashi (Daniel Henney) in the city of San Fransokyo (you read that right). Hiro graduated high school at age 14, and spends his time taking part in illegal ‘bot fights. Tadashi, hoping to inspire Hiro to apply himself, brings Hiro to the San Fransokyo Institute of Technology, where Tadashi and his friends are working with cutting-edge tools to make the world a better place. Hiro wants in, and he earns his acceptance after dazzling Professor Robert Callaghan (James Cromwell) with his newest invention, mind-controlled microbots. The microbots are almost immediately lost in a fire, which takes the lives of Callaghan and Tadashi. Shortly afterward, Hiro discovers that his microbots are being manufactured in a seemingly abandoned factory, and he is nearly killed by a masked man who’s controlling them in ways that they were never intended to be used. Hiro convinces Tadashi’s fellow colleagues to team up and use their super smarts to unmask the man who stole Hiro’s tech. The cast of this movie is a Benetton ad of racial diversity, with two Asian-Americans, one Latin-American, one African-American, and one Caucasian. It’s a genius move from a marketing perspective (nearly every country will have someone to cheer for! ), and a cynical move for the same reason (they’re just checking off demographic boxes! We could take this further, but…spoilers). While it’s tempting to lean in the latter direction, they actually did a great job of taking these characters and acclimating them to the Disney universe, starting with the “Iron Man 3”-esque decision to strip the characters of any paranormal abilities or magical objects. There are references here and there to the characters’ comic book origins – the magical purse of Honey Lemon (Genesis Rodriguez), for example – but in this world, the objects aren’t magical: they’re just tech-enhanced. Think of the “Big Hero 6” film as the “Terminator: Genysis” of the “Big Hero 6” comic. It should be treated like a parallel universe, rather than a straight interpretation. 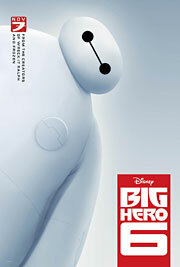 And then there’s Baymax, the inflatable health care assistant robot designed by Tadashi, brilliantly voiced by Scott Adsit (“30 Rock”), and a complete reimagining of the character. 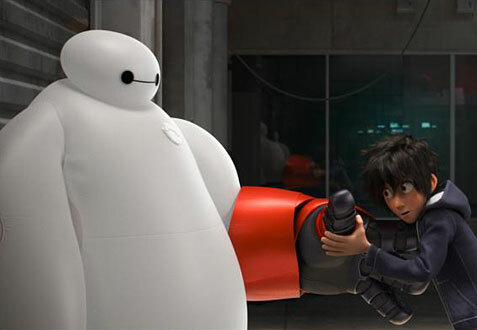 (Comic book Baymax is a monster designed to protect Hiro.) The inevitable comparison will be to WALL•E, and in terms of their likability, that is completely fair, as Baymax is one of the most likable characters Disney has created in a long time. His personality is nothing like WALL•E, though; WALL•E was more human than most humans, but Baymax is pure robot in how he processes information, even as he’s helping Hiro save his own humanity when the need for revenge threatens to consume him. It is staggering to think that the two biggest hits this year could be adaptations of “Guardians of the Galaxy” and “Big Hero 6,” two of the most obscure titles in Marvel’s catalog. In an industry that seems convinced that there are no new ideas or unfamiliar properties worth exploring (see: the reboot of “National Lampoon’s Vacation”), it’s nice to see Disney, of all studios, stick their necks out and go with the unknown for their holiday tentpole movie. And just like that, Disney has a new franchise in waiting for their animation department, which could (and most certainly will) lead to their first animated sequel since “The Rescuers Down Under” was released in 1990. Phase 1 of the Marvel Toons era, as it were, is off to a very promising start. Note: Since this is a Marvel property, make sure to stay through the credits.